J.I. AUSTEN CO. CHICAGO, PUBLISHER, COLORED PRINT J.I. 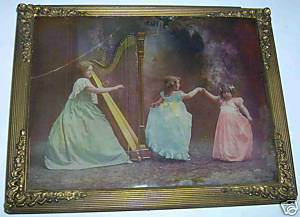 AUSTEN CO COLORED PRINT 1893 GIRL PLAYING HARP TWO DANCING GIRLS 9 1/2" X 7 1/2" SIGNED: COPYRIGHT 1893 J. I. AUSTEN CO. CH J.I., AUSTEN CO. CHICAGO, PUBLISHER, COLORED PRINT, C 1893, 9 1/2" X 7 1/2", VICTORIAN GIRL PLAYING HARP WITH TWO YOUNG VICTORIAN GIRLS DANCING gilt wood frame. Print looks like a photograph that has been printed in litho, if that makes any sense. Some fading in the lower right corner of the print, see the photo, the glass has a crack in the left corner, and the frame has an inch long chip from the gold gilt wood cover on the top right outside edge. the glass is coming loosed from its mounting and has several edge nicks. FYI Early Chicago Publisher Best know for their stereographs, Black Americana Postcards, postcards, they also printed books, lithograph prints, Two-sided puzzles on wood, maps.